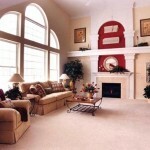 Extra-big rooms like this family room can end up looking like a gymnasium, so I’ve never been a fan of them in general. 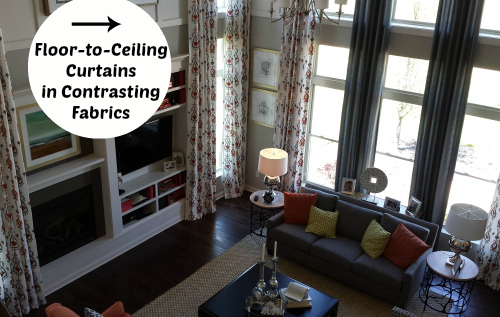 The floor-to-ceiling window treatments warmed it up, though, and they “framed” the center windows on the window wall with a solid gray-blue fabric. 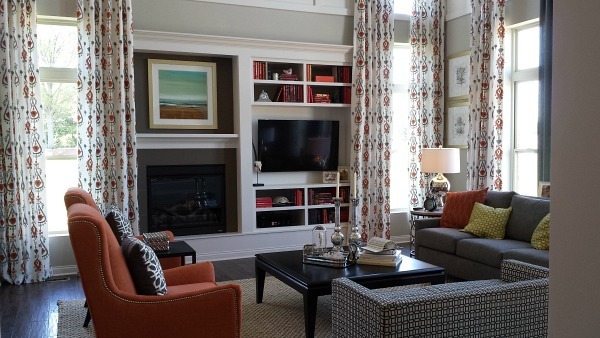 Sometimes model homes either pretend you won’t be watching TV in the family room or put it over the fireplace. So it was interesting to see how they solved the dilemma of where to put the flat-screen by creating space for both in the center of the focal wall. It would have been nice to see a grander fireplace on such a tall wall, but it wouldn’t have been as practical for the family who ends up living here. I was really surprised to see that they created a border with woodwork that ran around the top of the room. Usually you’d see something like this at the bottom. It was another way of breaking up the huge two-story-tall walls. This builder didn’t ignore any empty spaces, including the staircase landing. Bonus points for making it deep enough and comfortable enough to actually use! 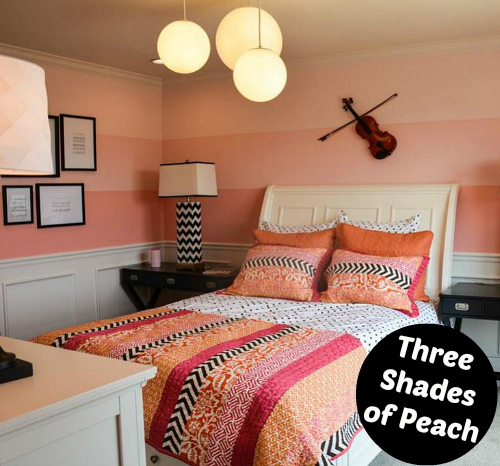 In one of the bedrooms, the designer took three shades of peach and painted them in wide horizontal stripes from light to dark on the wall. Using pages from songs that have meaning to you would be a fun idea. My husband is a musician and this would be cool in his study-slash-music room. They took the hardwood flooring that was used in the rest of the house and created a dramatic planked wall with it in one of the bedrooms. 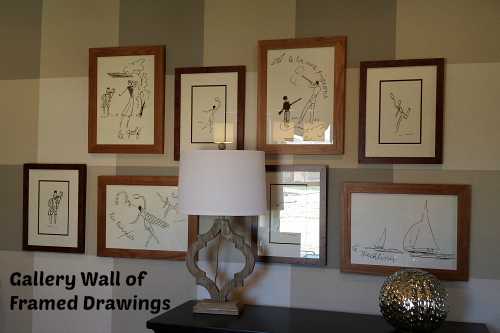 This gallery wall of drawings in the first-floor study gave me an idea for something I’d like to try with some of my kids’ artwork in our house. I like that all the frames are wood but in two different tones to mix things up a bit. 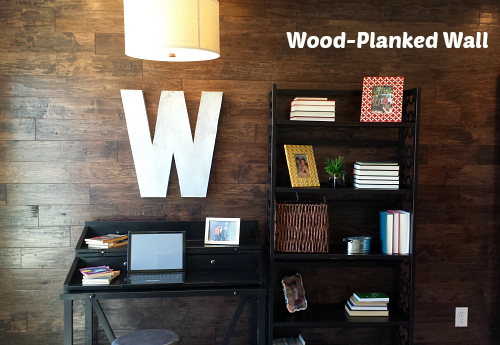 The walls of the home office were painted in an oversized plaid pattern. 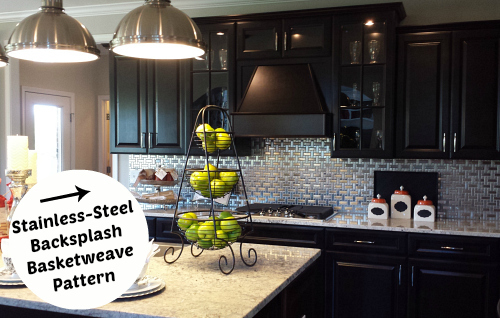 They used stainless steel tile for the backsplash in the kitchen, which looked dramatic next to the black cabinets. The basketweave pattern kept it from looking too contemporary for the room. The house was built by M/I Homes in Mason, Ohio, and the plan is called The Monroe. In that development it starts at half a million, but that’s before all the fabulous upgrades you’d probably want are added. “That’s how they get ya!” as my grandma would say. The house mostly had pale gray walls with orange and blue accents. What did you see that you liked — or didn’t — in the house? I saw a lot of current trends playing out in this one. Tomorrow I’ll give you a look inside the smaller model. I have been wanting to get over there to walk though the new MI models here in Mason! Thanks so much for the preview! Did you get the chance to view the smaller model too? Those have really intrigued me as well! Have a great day! Can’t wait to see the photos! 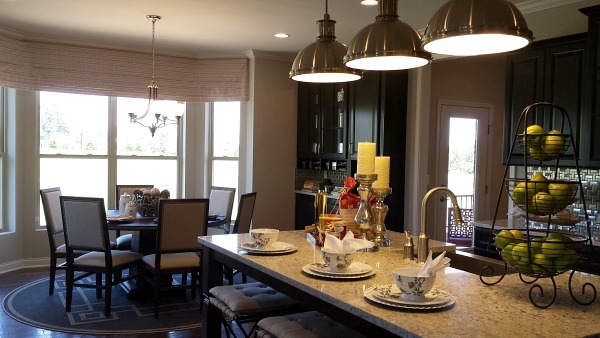 Are you planning a trip to Homearama this year? We just went yesterday and had a great time! I like a lot of that – love the plaid wall effect, and I’m a sucker for windowseats. One thing that does occur to me as a drawback is that fact that it is so open plan. I realise that that is an ‘in’ thing right now, but I’m afraid I look at it and think it is an awful lot of space to heat in the winter if you’re using just one room (I’m thinking particularly of the living area open to the stairwell and at least one upstairs room). Maybe it’s because I live in the UK – although, Ohio? I thought they got proper winter there? – but I like me an occasional door! 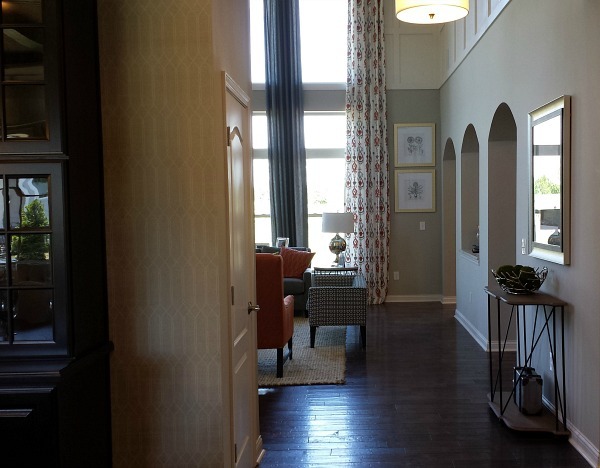 Overall very pretty – some serious detail work – especially love the painted ceiling. It would definitely be expensive to heat in winter in Ohio. We had a two-story family room in one of our former houses and froze all winter but paid HUGE electric bills because we had a heat pump that never got that room really warm enough. We’d have to put out space heaters on cold days. So no more two-story family rooms for me! Ha! I am ahead of my time! I’ve had the same plaid walls in my bedroom for nearly 15 years! Now I’m kind of tired of them though and ready to change things up a bit! Thanks for the nice pictures! Beautiful home! The floorplan is open, but not too open (like having a kitchen in the living room). The den is separated from living spaces, so nice and quiet with its own powder room. The more colorful and patterned painted walls. The floors are gorgeous, and not the high gloss polished kind. Light fixtures over the bar. Family room built-ins, great space to put the tv and some dvd’s and all that good stuff. Too many banisters on top of the staircase, it almost looks like a playset off a playground up there. Grey, grey, grey. I’m getting tired of grey. 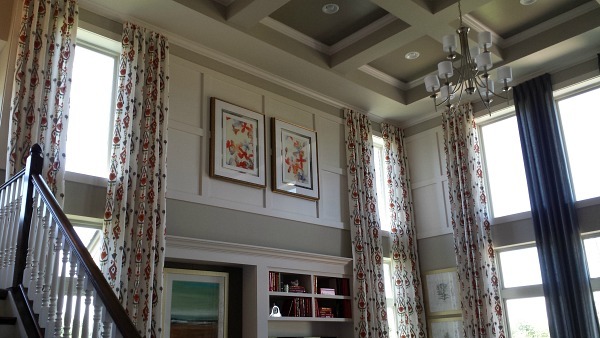 Those fabric cornices over the window seating and breakfast area (makes it look like the windows have ‘eyebrows’). I agree with you on the fabric cornices, Aubry. Not my fave. 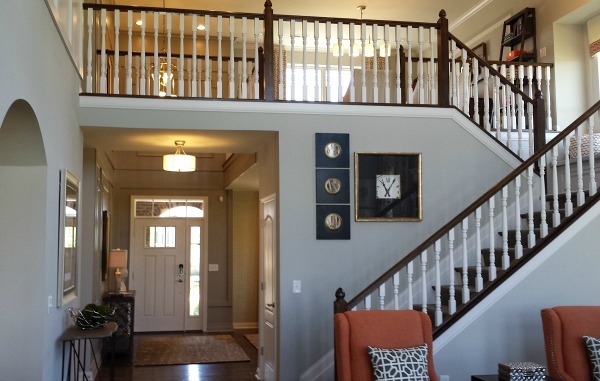 They have to have so many balusters because of the building code. That does seem to be the thing now, doesn’t it? Lots of dining rooms right off the entry. Not sure why, although I suspect that they aren’t expecting them to get a lot of use! Most people keep their dining room straightened up, so putting it just inside the front door means that anyone coming through that door sees the cleanest part of the house. 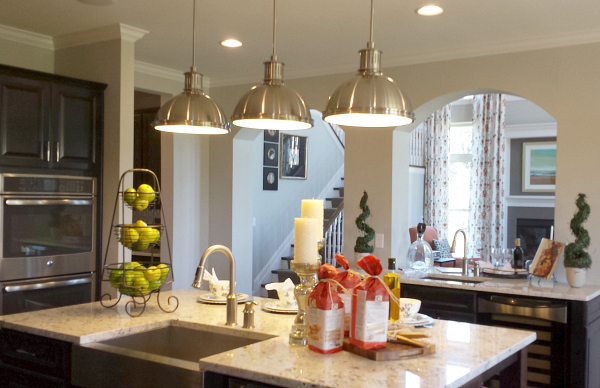 Of course, it makes more sense to have the kitchen right behind the dining room, if you plan to serve food in it. So in this house, it’s not the dining room that’s in the wrong place, it’s the kitchen. Very true. I like having my dining room off the front door because it’s one room that’s generally in decent shape. It kind of becomes an extension of the entry hall in that way. But like you said, Margaret, if you’re going to use it, you really do need the kitchen connected to it. It would annoy me if it wasn’t. center hall colonials often have dining rooms off of entry halls, but they are also connected with the kitchen 🙂 which this one is not. its just weird seeing the front door while you’re at the table. can’t do that in c.h. colonials. oh me either! Dining room far away from the kitchen is my biggest home design pet peeve. It’s just blatantly screaming that the architect never actually believed it was a room that would be used more than twice a year. It’s a pretend show room. what a huge waste of space and expense! I totally agree. This was the only fault I had with this otherwise lovely home. That’s what I was thinking! I don’t like it when dining rooms aren’t close to the kitchen. I either wouldn’t use it as a dining room at all, or it would rarely get used. Well, I don’t like the two story room. It’s a pain to keep cool in the summer and a pain to keep warm in the winter and have a decent sized bill. I’d rather have low ceilings. Second, I don’t like how the formal dinning room is at the front of the house while the kitchen is in the back. I’d rather turn the family room into the dinning room and the dinning room into a piano room/sitting area or study/office. Third, I don’t like wood-paneled walls, so that would be out. And I’d much rather have warm colors in the kitchen than stainless steel. But I do like that window seat on the landing, and I love the railing on the stairs. Am I the only who thinks this a poorly designed house? The dining room is too far from the kitchen and would work much better where the den is. I don’t get why home designers put the dining room so far from kitchen. I think the 2 story family/living room will be very expensive to heat and cool, no matter what part of the country you live in. I would prefer to have my laundry room upstairs where the bedrooms are. Add a shower to the powder room off the den and the den could then do double duty as a guest suite, it seems large enough. I’d want a laundry room closer to the master, too, Kelly. That’s a lot of stairs to be going up and down with baskets full of clothes all the time! I like your idea for making the powder room a full bath, too. Add a closet to the den and you could call it another bedroom when it comes time for resale. I thought the same thing about the den. Put in a closet and a shower in the powder room and you have a bedroom suite on the main floor which you never know you might need. Have you ever sprained your ankle and had to go upstairs? Plus, as you mentioned, it would be great for resale. Maybe that’s another one of those upgrades. I’ve become a fan of tall ceilings vs. two story ones nowadays. That way you still get the feeling of height without losing the square footage on the second floor. I love the built in cabinet in the dining room and the plaid walls are a great idea too. 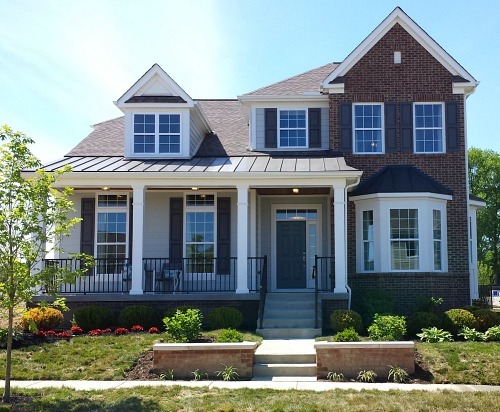 You’re not far from me in Mason – I’m really looking forward to Homearama again this year. Last year’s was a-mazing! This isn’t a style of home I want to live in, but I do like all the little finishing touches like the crown molding and the board and batten and the arched doorways. 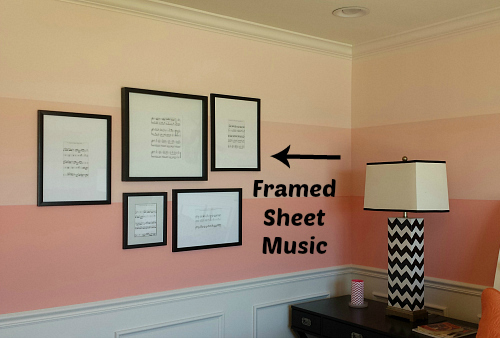 I’ve been thinking of framing some sheet music to hang up in our home, so that was interesting to see in this house. Those long curtains would probably cost a small fortune! Thanks for sharing. Looking forward to seeing the smaller house! I thought the same thing about those window treatments. All that fabric had to be expensive! The two sinks in the kitchen seems silly to me. Double cleaning! That being said, I notice that double sinks in the kitchen “are out”. Did I miss something? I notice more new kitchens highlight their ” single bowl” as a great feature, as if having a double bowl is out of style. I also agree with others about the dining room in the front, I don’t like that at all, nor do I care for the style of that built-in, I’d have to change that out! We don’t have mud rooms in So CA, but that would be great for kids and pets! I also didn’t see outside access from the family room? Or were there doors/sliders? Because of our climate, we spend time outside on patios; I also didn’t notice a sunroom- for that price that should be a must! Also, not a fan of the open concept/high ceilings/grey paint trend. Still a big fan of smaller cottages so I can’t wait to see your post tomorrow! If I recall correctly, there’s a door with access to the backyard in the kitchen instead of the family room. I’m not sure why two sinks would be needed, either, really. They kind of treated that area with the second sink like a bar area with a built-in wine cooler, I believe. Okay, gotta chime in on the single bowl sink thing, as it is, hands down, my favorite thing about my new kitchen. It’s not about style; it’s about FUNCTIONALITY. I hated my double bowl sink (especially since the side with the garbage disposal was on a smaller sink–what?!) Just yesterday I was doing a commercial in my head as I washed an entire double pancake griddle in my sink, easy-peasy. And because mine even has the drain off-center (genius), I can still have roasting pans in the sink, yet rinse plates off in disposal “side”. It’s also faster to clean, I think. (It’s also a Blanco silgranite composite sink, which shows almost too little dirt, so I can get lazy.) Okay, now I’m off my crazy sink soapbox! What a great house– it always amazes me how much more you can get for your money in other parts of the country. Here in Boston, that house would cost at least 1.5M! 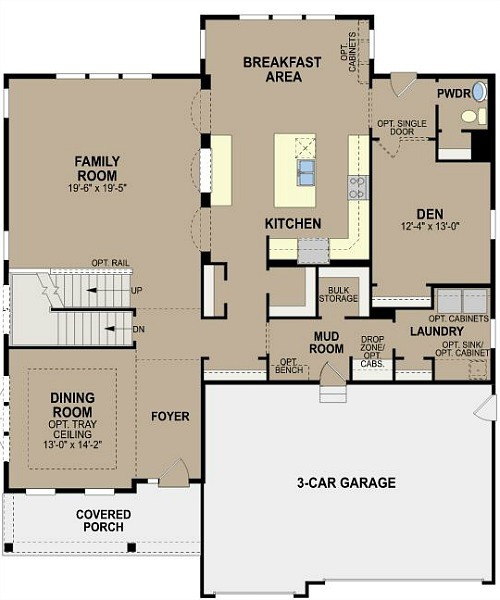 With $3,800 square feet to work with, I would expect a small formal sitting room, preferably right where the dining room is. I like a place to sit and chat with my friends without taking them into the family room where the TV will be on and probably a bit of man-mess around. 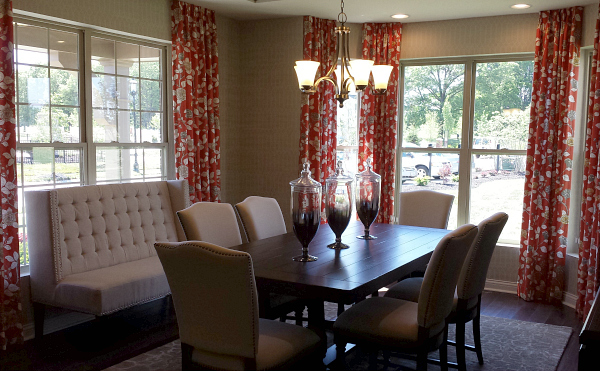 I suppose you could just turn the dining room into one, but I like a formal dining room, too. I really wasn’t crazy about the print fabrics either. I thought they were a little too country-cottage for that sort of house. I love the couch in front of the window in the dining room. Very nice. 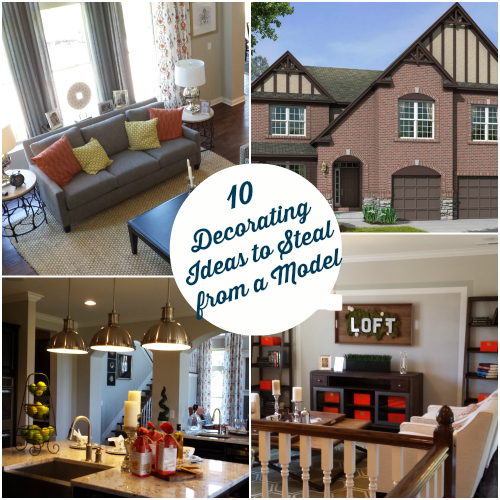 Not a huge fan of the house, but I agree there are some interesting ideas throughout. My dining room is right off my kitchen, where it should be. LOL Ahhh some builders are so funny! I do like to wash my curtains now and then, my mom would be so proud LOL, so the two story thing means needing a ladder and that does not appeal to me in any way. Do love the ceiling though! Also, while the kitchen is nice, not really feeling the backsplash. I wonder if you could fit one of those long window panels into a washing machine? That could be a problem, not to mention the trick of taking them down in the first place! LOL There is a tool for that. With all the tall ceilings in houses now, I’m sure they sell a lot of those! I wonder if they’d work for my foyer lantern? Might need to get myself one and try it! The worst thing is, the smoke alarm. Our old house had tall ceilings like that, and of course the smoke alarm battery died in the middle of the night. The hubby just ended up whacking it down with a long stick standing on a ladder. Never put it back up. I hadn’t thought of that, Aubry! What a pain. Oh, my…I think that would drive me a little bonkers. Ha. And what is it with every new house I have seen in the US ..why do they incorporate the garage in to the house right on the front I think it looks ugly !..why not next to it or behind the house !? Interestingly, this neighborhood gives you the option of having a garage in back if you don’t like this look. The house I’ll show you tomorrow has that kind of plan. The problem with that, though, is that you then have views of your garage from the back rooms of your house — not to mention very little yard because it takes up most of the lot. But the house does look more charming from the front without it, for sure. Agreed! Front entrance garage makes the house look like an auto repair shop! Thanks for sharing! I have to say, though, there wasn’t a whole bunch I did like. The curtains in different fabrics was terrible, the fireplace/tv/shelf thing was way too busy to be a nice focal point, black cabinets are too harsh and will be a pain to keep looking clean, plus if you have to do wood trim that high up on a wall as in the family room maybe that’s a sign the room is just too tall. I would have preferred a large fireplace in the family room and put the t.v. upstairs in the loft area for starters. The plaid wall is nice but it’s a direct copy of a recent Southern Living home. I don’t particularly love the layout, but I REALLY don’t care for how it was decorated and styled. Maybe it looks better in person? I don’t know, you might not like it in person, either, but I had fun walking through it and seeing how they decorated it, even if it wasn’t my personal style. I think I can find things to like about any house I walk through, really. I have seen so many new houses without any character in them at all — just big slates of drywall everywhere — that I was happy to see that they tried to give this one some with woodwork, built-ins, etc. 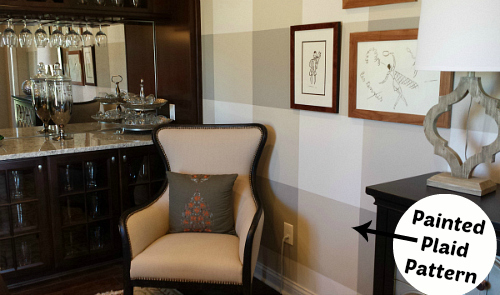 The one house trend I will never get into, (besides wallpaper) is painting walls gray toned colors. They make a home feel cold and sterile. I’m with you, Kim. Not a gray person. I did think the blues and oranges helped warm the rooms up a little, though, at least. Yeah I thought the blues and oranges warmed up the house too! It made it feel somewhat bright and cherry. Julia, I loved this article! I’d very much enjoy seeing more model home features. I’m embarrassed to say that my ideal taste is probably 75% model-home (I think that makes me a boring person) and most decorating blogs are much too eclectic for me. To other commenters, I’d personally turn that dining room into a library and just eat the breakfast nook. Why everyone is supposed to need two full sized eating areas on the main floor of their house I’ll never know! I did like that they tried to give a nod to the fireplace vs tv issue, but that is what a 50 inch tv in a half million dollar house? I prefer the design problem to be a grand fireplace between two windows (you didn’t want to be watching tv on a windowed wall anyway) and room for a 60 inch television on one of the adjoining walls. I like the idea of using that dining room as a sitting room or something more practical. It has all those great windows and looks like a cozy spot to hang out. Excellent point about the two full-sized eating areas, J ! And I like your placement of the TV and fireplace much better, too. 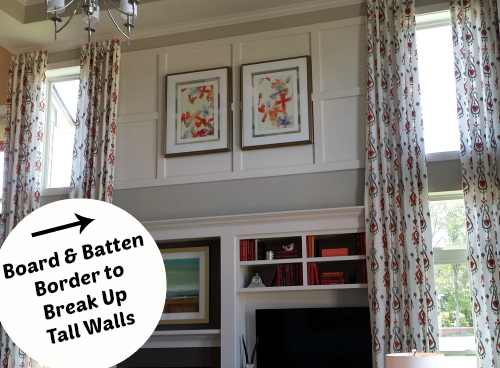 Do you happen to know the name of the ikat drapery in the Family room? I love it! Sorry, I don’t. Does anyone else recognize it? I think that the dining room is too far from the kitchen. For me, I would prefer that the den and the dining room were switched. Yikes? Half a million? That’s a good reason to live in Milford instead of Mason! 🙂 Thanks for showing us inside the model home, though. It’s always fun to look and dream! I tried. I really tried, Julia! But after looking at every single picture, I can’t find a single thing about that house that is appeaing. It’s so cold and poorly laid out, and those tall cellings don’t fool anybody into thinking they have more square footage. And that built-in in the DR is just a bulky version of the china cabinets that one sees at every estate sale nowadays. Those print draperies? They look like 1960’s cheap shower curtains. The wood floors looked nice, tho! I have never been a fan of “great rooms” or two story rooms, but I am only 5 foot tall myself so I feel a bit overwhelmed in those type of rooms. When I see curtains that tall all I can think is how on earth do I vacuum those in between washings? I find the entertainment wall an interesting solution to an on-going problem. Not a fan of ombré or plaid painted walls or the stainless steel backsplash. I do like the artwork ideas and a window seat is always welcome. I am looking forward to tomorrow’s smaller home. I always find design in other countries particularly interesting so thank you for posting. Comparing this to what I see here in Australia, current design trends in new homes it’s very rare to see formal dining rooms. Butlers pantries off the kitchen are very popular here. Some incorporate dishwashers, cooktops and the refridgerator so all your food prep is done there rather than the main kitchen; which becomes more a ‘show’ kitchen! What I thought was very practical though was the laundry on the second floor. It makes sense since that’s where the bedrooms are but to hang clothes outside to dry still means a trip downstairs with the washing basket, unless of course it all goes in the dryer. Interesting! Enjoyed hearing your perspective and what’s trending there — thanks, Paul. Most people in the USA do not hang clothes out to dry, in fact in many subdivisions clothes lines are forbidden…. Your grandma is right! That is how they get ya! Someone did a good job staging the rooms in this house. I like how they have the TV mounted on the wall next to the fireplace. I always think that people have to get a stiff neck looking up at their TV way up over the fireplace. Love the kitchen, window seat and paint treatments. Thank you for sharing. I am looking forward to seeing the smaller model. I don’t know why, but big houses overwhelm me. I like the loft and the window seat. I don’t like that the dining room has the front door in it, but I did like that built in!!! I think it is really pretty and has lots of great ideas. They did a great job warming it up and enhancing the large windows and spaces. I love the colors. It might not be my favorite style but I would enjoy hanging out there. I don’t like tall ceilings and cavern-like open concept great rooms…pretty much don’t like new houses since they all seem to be that way. I like small, older, with character, quaintness, etc. so I’d never buy one of these. 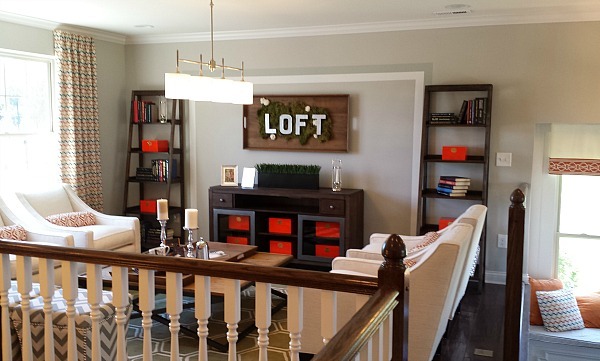 I love the open staircase and I love some of the ideas like the framed sheet music and framed kids artwork. I really need to do that! 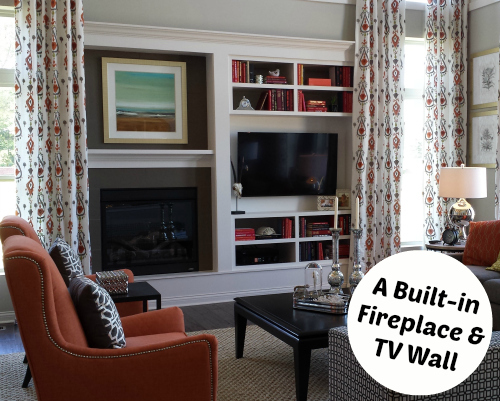 I’m not a fan of the whole TV/fireplace wall. The fireplace is so bland it looks like another TV only lower. There is nothing defining about it. I also never got the appeal of loft areas. I have the ceilings in my family room and a long bridge walkway. I can see the bedroom doors and as my kids grew to adults the noise level for everyone is annoying. The bedroom doors must be closed at all times. It would see with a loft there would be the same kinds of noises from both levels. Yeah, I have friends with that kind of open-to-above floorplan and they complain about the same things. I can see how that would be annoying. I was always told to never make the TV the focal point. To me, putting the TV above the fireplace is an abomination. Other than that the noise factor with the open loft idea IS pretty miserable, I notice this in those “open concept” homes also. 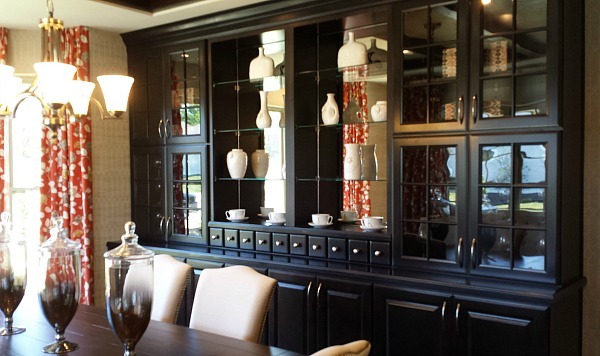 The cabinet in the dining room made me drool. The rest, not so much. What I don’t understand, other than as a cost saving issue, perhaps, is why the builder only puts muntins (window pane dividers) on the front elevation? It’s a traditional Tudoresque house, so you would expect them in all windows. I understand if you have a different style window in the tall family room, but look at the double hung windows in the dining room. The double window facing the front has them, but the one on the side doesn’t. Just looks cheap to me. At least they should be consistent in the same room! Or maybe it’s the glare from the light coming through the windows and I can’t see them. Am I wrong? Hard to tell, but it also looks like many of the windows are not ‘cased out,’ meaning there are no wood casings or trim around them. Note dining room windows. That’s a new house thing that I can’t stand and you’d only see in cheap apartments here in the south. Surprising on a house for that price. Wow, I hadn’t even noticed that until you pointed it out, but you’re right. I know when we built our house they charged extra to put the dividers on any windows besides the ones in front, so that’s all I can figure. But they upgraded everything else in the model, so why not those, as well? Puzzling! Very valid points made by readers. 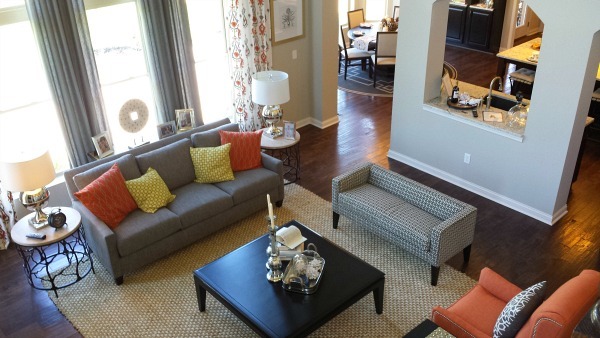 I’m not really a new house person, but I think if you’re designing a new home, it should look new and modern. This, to me, feels all over the place, design-wise. A bit modern, a bit traditional, a bit country, a bit vintage. I appreciate that they made an effort to cosy it up, but I think it would have been more effective if they had chosen one unified look. TV as a focal point? Tacky & common. Every poorly decorated home has the furniture in living room pointing toward the God of the Glowing Rectangular Screens. This tells me that the television is the most revered and important thing in a home when they do this. The ombre paint on the walls, good- the builtins even better! Blast from the past. Very “homey” and comforting, attractive. 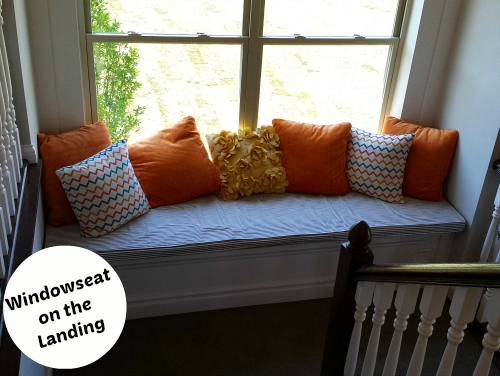 I fell in love with the window seat and the plaid paint treatment! 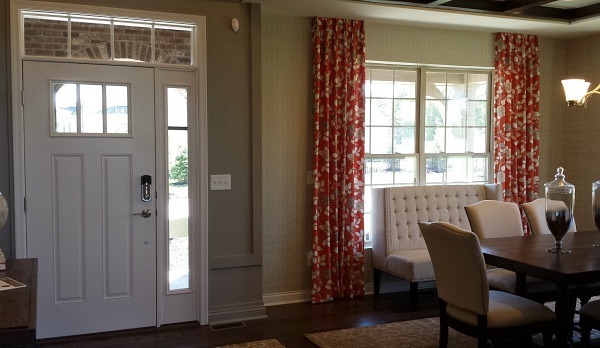 Rather than criticizing the decorator of this model home, I’ll congratulate him/her. I subtracted the ‘upgrades’, looked at the floor plan/design and thought about the budget or warehoused furniture the builder provided. The decorator’s job was to jazz this dog up and sell houses. 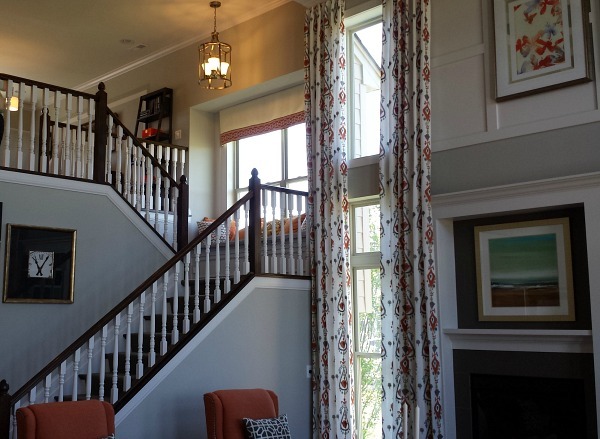 First tip off was the two story living area–the decorator worked all the tricks to bring that ceiling down and cozy up the room; as in, “forget high utilities–look at that great board & batten! 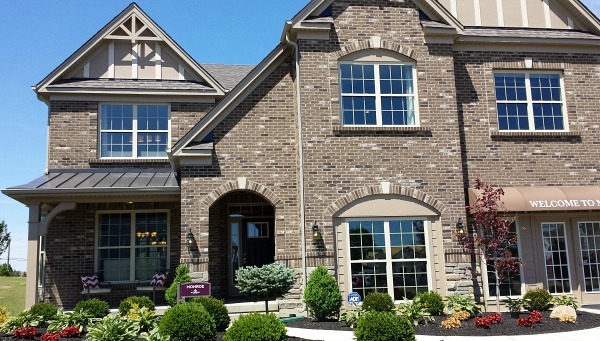 !” In our planned community, the builder installed lots of model homes. The fun was visiting to see how their stockpile of furnishing was re-used, re-invented. I’m betting that the mix of long drapes was making creative use of what was available. Thanks for sharing, Julia! So true, Susan. If I was asked to decorate such a big house and make that huge 2-story family room look livable, I wouldn’t know where to start. I thought they did a great job working with the blank slate they had to start with! I like almost everything about this house which is quite rare! I really like what they did with the tall windows, one of the best configurations I’ve seen of tall windows. I agree I would have liked a more grand fireplace. The paint choices for the house are on par with the trends but at the same time not to wild that you couldn’t live with it for a few years. The backsplash in the kitchen is unexpected but quite nice.